Taipei is an awesome place to live. Really. I mean, the food is great (don’t think there’s not a post on that topic coming! ), there is almost no crime to speak of (in fact, the only arrest we’ve heard of is a man who caused a riot by emptying a sack full of money in the middle of Taipei—yes, you read the correctly…the only crime we’ve heard of is someone giving out money), and the people here are incredibly polite and helpful, almost forcefully so. I always love discovering the peculiarities of a place, and Taipei has no shortage of distinctive qualities…read on if this is the type of thing you’re interested in too. OK, let me help you decipher: this person lives on Zhong Shan North Road, Section 2. All major streets in Taipei are aligned to a grid, with a central axis point more or less around Taipei Main Station (an absolutely enormous labyrinth-like confluence of buses, subway, high-speed rail, and regular railway…with 4 underground shopping malls thrown in for good measure). All major roads are broken into north/south or east/west depending on where they are located in relation to the axis (i.e., Zhong Shan North Road is the length of road to the north of Main Station). Major streets are further broken into sections, and the closer you are to the axis (i.e., Taipei Main Station), the smaller the section number (i.e., section 2 is closer to main station than section 5). To find this address, you need to be in section 2 of Zhong Shan North Road. 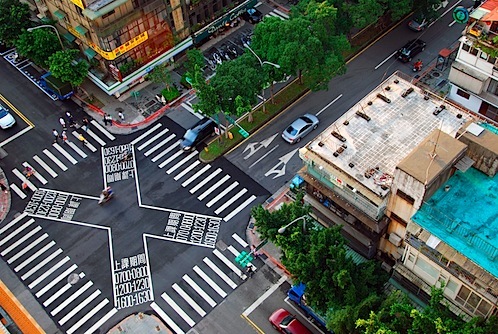 Taipei also has numbered lanes that run perpendicular to major streets. To find Lane 80, walk up to where the building numbered 80 should be…that’s where you’ll find the lane. Similarly, alleys are perpendicular to lanes and you will find alley 15 where the building numbered 15 should be (luckily, there is nothing smaller than an alley). Taipei cityscape, taken right outside of Taipei Main Station’s entrance M8. OK, we’re almost there…we are at Alley 15, Lane 80, Zhong Shan North Road, Section 2. Now you need to find building #3 in this complex, head to the 4th floor, and find apartment #5. Schwoo! That wasn’t so hard, was it? Once you get the hang of it, this address system works really well—actually, Jeremy thinks it is brilliant. In effect, every address is like a built-in map. You really only need to know the major roads in order to find an address…and quite honestly, in a city as densely populated as Taipei, this is a really logical way of organizing things. Alright, the address system is very logical and organized, but there are a few complexities. 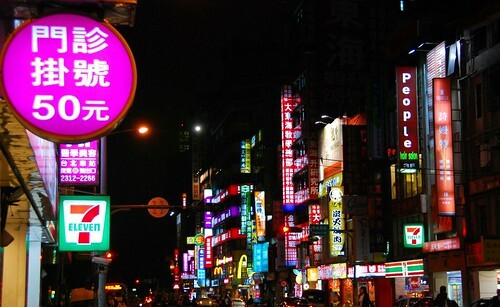 All streets in Taipei are labeled in both Chinese and English, but the difficulties arise in the Romanization of the Chinese language. Namely, Taipei used to use the Wade-Giles Romanization system (which I find quite unintuitive), but recently switched over to the Hanyu Pinyin system, in line with mainland China (BTW, I am only familiar with the Hanyu Pinyin system, so any Mandarin words that are mentioned on 12FOOT3 will use this system). The view of the street below from our 14th floor balcony. In fact, if Taipei were to be named according to the Hanyu Pinyin system, it would actually be Taibei. Note that while the street names have been translated over to Hanyu Pinyin, all city names are still spelled according to the Wade-Giles system. Public Transport: Get Your 上 and 下 on! The Taipei subway system (MRT) is cheap, super fast, clean, and easy to use (all signage is in English and Chinese, so even non-Mandarin speakers can find their way around). The bus, however, is a different story. Although the subway is awesome, it doesn’t reach every little nook and cranny of Taipei, but the bus system does. The problem is, there is no bus guidebook in English, so you’re just going to have to ask for help getting where you want to go (see the next section for more on getting help). The buses have this weird system where you pay when you get on or get off (and depending on how far you’re traveling on the bus, sometimes both). There is a sign above the driver’s head that has the Chinese character for “up” (上) or “down” (下). If “up” is lit, you pay when boarding the bus; if “down” is lit, then you pay when you get off. If “up” is lit when you get on and “down” is lit when you want to get off, then you pay both times. If you happen to get lost in Taipei, don’t worry, because someone will help you. Seriously, don’t ask anyone for help unless you really mean it, because Taiwanese people are aggressively helpful. On more than one occasion, we’ve asked someone for directions, only to have the person next to them start arguing that their directions are not direct enough. Pretty soon, the entire bus is arguing about what is the fastest, most efficient way for the two foreigners to get to point B (in at least three different languages). 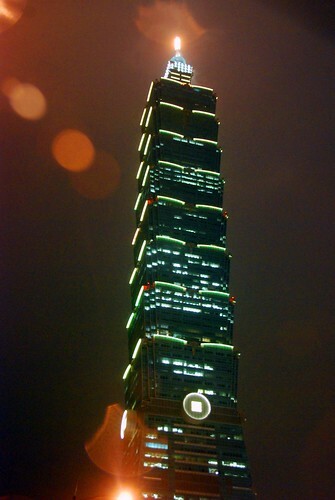 Which way to Taipei 101? We’re not exaggerating—we’ve been out on the middle of nowhere, lost on a hiking trail…finally, someone comes along and we ask directions. Without fail, another person will magically appear out of the ether and start arguing that the path person 1 has recommended will take too long and that he knows a quicker way. The Lonely Planet suggests that Taiwanese are helpful towards foreigners because they are just happy that you know they exist, given the fact that they are often overshadowed by the bigger, more controversial neighbor to the north. But I disagree—I think it is because Chinese kids are raised to be extremely well-mannered and polite (ke qi), and respectful towards others, especially towards the elderly. I understand this firsthand because these are some of the values that my own parents stressed to my brother and I when we were growing up. Of course, Eddo and I grew up in the States so we’ve sort of got the worst of both worlds…Chinese enough to know better but American enough to rebel against it (ahem, just kidding, Mom and Dad!). The first example you’ll see of this famous politeness is on the bus. Whenever an old person gets on, people will immediately get up and offer that person their seat. Same goes for someone with a small child, or a pregnant woman. There is no hesitation; and often several people will stand up at the same time in a rush to offer the old person their chair. 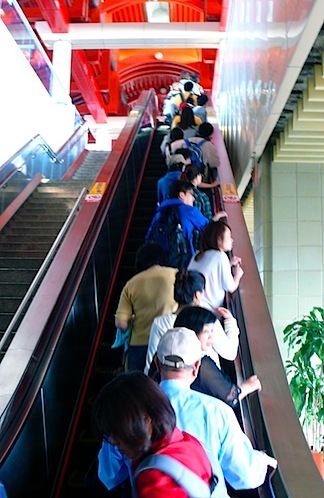 Perhaps the most amazing display of good manners is on escalators. EVERYBODY stands in a neat, single-file line to the right side of the escalator, with those who wish to walk passing on the left. Jeremy was amazed by this! Don’t believe me? See for yourself! Not a person out of place. This politeness means that people never, ever say “can I get by?” if you are in their way. Instead, it’s “dui bu qi” (”I’m sorry”). Also, if you ask them a question that they can’t answer, a simple “I’m sorry, I don’t know” won’t suffice: it’s “bu hao yi si” (”I’m embarrassed”). In fact, the other day, Jeremy was sitting in someone’s train seat and the guy came up and said, “bu hao yi si,” instead of “hey, buddy, you’re in my seat.” Of course, when he saw that the reason why Jeremy was sitting in his seat was due to an old person sitting in Jeremy’s, he wouldn’t claim his seat, even though it meant he would have to stand the 3.5 hour ride back to Taipei. All of these little curiosities make Taipei a breath of fresh air after the madness in SE Asia. It is one of the most civilized places we’ve ever been, which is awesome considering we will be here for a good portion of our trip. Of course, it will also make it difficult to leave. What a fabulous description of the hospitality and friendliness of the Taiwanese people. The bus story is priceless!